Vengeance Dad is a meme showing a photograph similar to PTSD Clarinet Boy – a studio photography style made popular in the 1980s, where a larger photo of a person’s head is superimposed over another photo. The juxtaposition of the two photos provided a fertile ground for humor, and this photo is no exception. The photo depicts the serious face of a father, with the rest of his family, wife and two children, covering part of his head. The photo is faded and judging by the clothing and eyeglasses worn, was taken some time in the 1980s, probably earlier in the decade. The picture demonstrates the fading and color loss that is common in older photographs of that era. 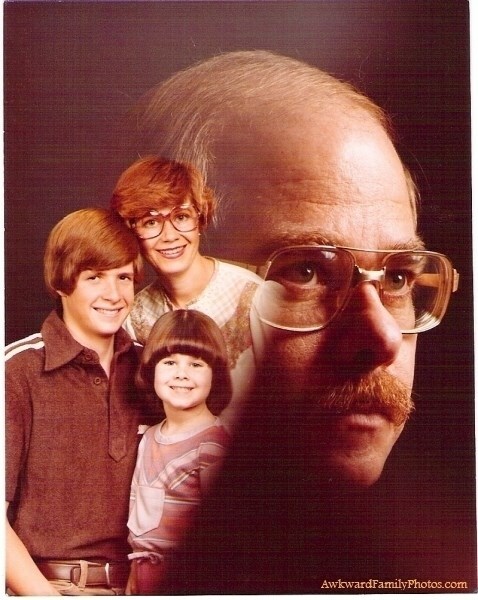 The original photo appeared on Awkward Family Photos in 2010. Uses of the photo for meme purposes tend to focus on the father going on a killing rampage, or being haunted by his violent past. The pensive expression on the father’s face is used to humorously interpret rather deep and serious thoughts having to do with anything showing a violent but necessary determined resolve. There is a humorous event when something that is light-hearted gets crossed with something deep and tragic. It helps us to laugh at the everyday foibles we have and not take things so seriously. Notable examples of this meme include the photo with the text: “They wanted to see Disneyland – I showed them Hell”, and “They said I would miss my family – I never miss at close range”.